Dylan O’Brien, Tyler Posey,and Crystal Reed wear black and optical white high top, and black and navy low cut Converse “Chuck Taylor” All Stars in the series. 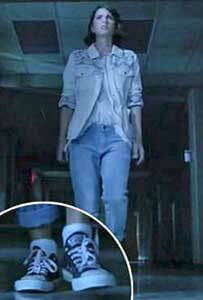 Stiles in the lab; skateboarding in optical white high tops. A television remake of the 1985 film, Teen Wolf focuses on the life of high school boy turned werewolf, Scott McCall (Tyler Posey), and the adventures he and his friends embark upon to keep him in control and the monsters at bay. With Scott’s newfound powers comes a wave of danger and threat to the small town of Beacon Hills, in the form of werewolves, shapeshifters, banshees, and other supernatural creatures. 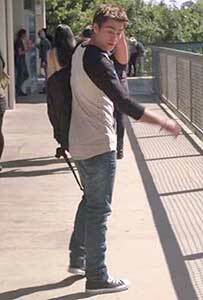 Many of the characters are seen sporting chucks, like Scott’s best friend and frequent life-saver, Stiles Stilinski (Dylan O’Brien). Goofy and geeky, yet fiercely loyal and clever, Stiles is often the much needed voice of reason and resolution in climactic situations, frequently figuring out key clues or connections that ultimately save the lives of his friends and family. Though he remains the only human of his supernatural friend group, he is an undisputable asset to the storyline, and an extremely humorous presence on the show. It is no wonder that this strong, humble, and comical character is frequently seen sporting chucks, the perfect shoe to accentuate his casual, easy going personality. Stiles Stilinski and Scott McCall. Stiles is always on the run, either rushing off to bring aid to his Scott or his friends, or fleeing from one of the numerous life-threatening situations he gets himself mixed up in. Unlike his werewolf friend Scott, he favors a more colorful palate, often wearing plaid and graphic t-shirts, which pair nicely with his colorful temperament, as well as with his chucks. 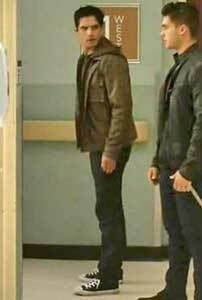 His choice of clothing and shoes set him aside from the darkly clad, supernatural characters, and further his ability to serve as arguably the most beloved, comically relieving and sympathetic character on the show. Other friends include Allison Argent, his first love interest who comes from a family of werewolf hunters, Lydia Martin, a banshee and Allison’s best friend, and Derek Hale, a mysterious werewolf with a dark past.